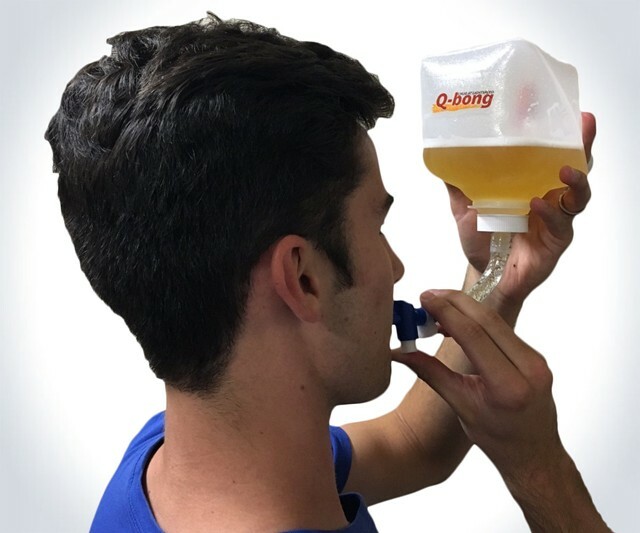 Q-Bong Pressurized Beer Bong | OhGizmo! By David Ponce on 03/02/17 • Leave a comment! A beer bong is a pretty good way to get a lot of beer inside your body in a very short timespan. But you might be one of those who feels that’s just not fast enough. Gravity isn’t cutting it for you? Well, that’s fine because now you can use the Q-Bong Beer Bong. It uses a pressurized reservoir and a one-handed trigger valve so you can basically squirt all that beer down your throat as fast as humanly possible. There’s a pressure bulb attached to the reservoir which lets you pump up the PSI as high as you want, so the more you pump the faster you’ll guzzle that malt liquor up. It holds 36 oz. and costs $20. And this is probably where we should tell you not to be idiots, and drink responsibly. Or at the very least, don’t drink and drive.